If you’ve been in sales for any length of time, you’ve probably experienced the frustration of continually following up on a “hot” sales lead only to eventually find out there is no interest. Where did the lead come from? There are many different ways that sales leads can be generated and that often determines the quality of the lead. Maybe your company targets a specific set of industries and purchases names that are then sent to sales as leads. Maybe your company runs sophisticated email campaigns and passes on leads to sales based on interest level parameters. Maybe your company only passes on form registrations as leads. Whatever the mechanism used, the key criteria to judging the quality of the lead is the interest level shown. Once you’ve determined where the lead came from you should be able to estimate the interest level of the prospect and therefore the quality. How do I distribute the leads to sales? This is a tricky question because much depends upon the size of your team versus the amount of leads your marketing engine generates. In a case of large sales team and few leads, it probably doesn’t matter how the leads are distributed. In a case of small sales team and many leads, it becomes much more important to focus on the highest quality (interest level) leads first. So, prioritize the leads based on where they came from and then ensure that the recipients of the leads treat them with the priority they deserve. Maybe low quality leads warrant one follow up call and an email while high quality leads warrant a successive call pattern over the next 30 days. Whenever possible, the recipient should also be given any additional information regarding the prospect’s interest level. What does success look like? Make sure you have a process in place to track progress and results. If you’re going to invest in lead generation you should also be able to monitor the results. Make sure the recipients are following up on the leads they receive and keep track of the wins to determine where you should focus your future lead generation efforts. If you are a VisitorTrack user or considering using VisitorTrack, let me relate the above back to ways you might be able optimize your use of the platform. I highly suggest putting the tool back into the hands of the individual sales person. Let sales run their individual reports based on their geographies and classifications and they will also be able to see the level of interest of the leads that VisitorTrack supplies. If sales owns the process, they will be much more likely to follow up on the leads they generate. No one knows your business better than you do. You know your ideal customer and you know how your offering addresses their needs. Don’t just rely on automated emails, spend some time building reports specific to your client profile and matching those up to the target pages on your website that you feel show the highest level of intent to buy. Develop a plan within your sales organization to assign priorities to leads generated from various sources. Then develop a mechanism to keep track of those leads throughout the sales process so that you can build data on what works the best. All sales leads are not created equal. Leads that signify a high interest level, like prospects scouring your website, should be treated with a higher focus than leads with no known interest level, like names generated from a target profile list. Hope you find this helpful and good luck in your revenue generation efforts. 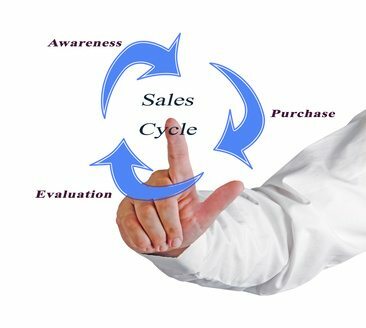 The game has changed in the B2B Sales Cycle. This is not only true for the constantly evolving sales process and methodology, but for customer decision making and technology as well. Nothing like pointing out the obvious, right? Back when I started my sales career the mantra was “people buy from people they like and trust” and the concept of “solution selling” was just starting to gain traction. My manager armed me with a phone card, and the yellow pages were my lead list. The sales team shared one computer because no one was sure if that email “thing” was ever going to take off. On a side note, before I date myself completely, my first employer was not exactly on the cutting edge of technology. From a customer perspective, voice mail was the new gatekeeper, and if a prospect had a question they picked up the phone and called sales. Now, let’s fast forward to today. While likability and credibility are still critical components of a sound business relationship, to gain a prospect’s attention you need to tell them something that will separate you from the pack. While email has become the communication vehicle of choice for many sales reps and customers alike, it has also amplified the “noise” of vendors seeking a share of wallet. Technology has afforded sales the ability to reach more qualified prospects, more quickly and more often. As a result, prospective customers are inundated with a barrage of messages around how a product or service will save them time and money. At the same time that technology has made it easier for sales to reach out, it has also made it easier for prospects to shut sales down. Additionally, prospective buyers now have the resources available to research how to fill their needs without involving a sales professional, and that trend is increasing every year. The vast majority of people in today’s business environment are tasked with doing more in less time, so as the noise of vendor solicitations continues to increase, prospects decide to shut off communication by ignoring the incoming messages and conducting their own research as needs arise. Unfortunately, there are a number of issues with this approach. Has the prospect identified the need correctly? Has the prospect considered all the possible alternatives? What real issues within the company aren’t being addressed? Often, it takes a professional from outside the organization to identify problems and find optimal solutions. As a sales professional, ask yourself this question. What is the value to me of knowing when a prospect is interested in my solution before they have identified themselves to me? Before you answer the question, here are a few interesting data points from various research studies. Over 40% of businesses now conduct research prior to engaging a vendor, at which point they have already completed close to 60% of their decision making process. Of the businesses that conduct research on a vendor’s website less than 2% identify themselves by filling out a contact form. Over 70% of vendors that engage with a prospect first, get the deal. Based on that, let’s assume you agree there is value in early identification of prospects visiting your website, but you are now struggling with quantifying what that value is. As a sales professional, you know your close ratios, your average selling price and how many additional qualified opportunities you or your sales team can handle. Multiply the additional opportunities by your average sales price and your close ratio and you should have a reasonable guess of additional sales potential. Be warned, depending on your business model, your result may look too good to be true. Just remember, it is still up to you and/or your sales team to follow a solid sales process to close the additional opportunities. In today’s environment, part of that process needs to include client centered impact messaging and consistent follow up. Having that messaging and consistency take place with someone that has already shown interest should increase the probability of a business relationship significantly. Since you’re reading this blog, you may already have VisitorTrack, in which case, congratulations, you have what you need to get started in targeting the prospects that have already shown an interest in your offering. It’s easy, but you can always call us to get some guidance. If you don’t have a tool for early identification, considering the trend and your company’s specific challenges, you may want to look into it. The science (yes I said science instead of art) of selling continues to evolve and initial engagement is becoming more and more challenging. Good luck in your selling efforts.